A while back, our family took a long driving vacation across the western U.S., with two small children in the back seat. To save our sanity, we relied on a hastily rented batch of audio books. Road miles go a lot faster when LeVar Burton holds court, or when a similarly skilled narrator conjures up the secrets of a Harry Potter novel. Hang on to that concept of the "skilled narrator." I've spent nearly 20 hours in the recording booth myself this summer, in an adventure both daunting and exhilarating. In this post, I'll share what the pros have taught me about narration -- and how those tips could help you become a better public speaker in any setting. 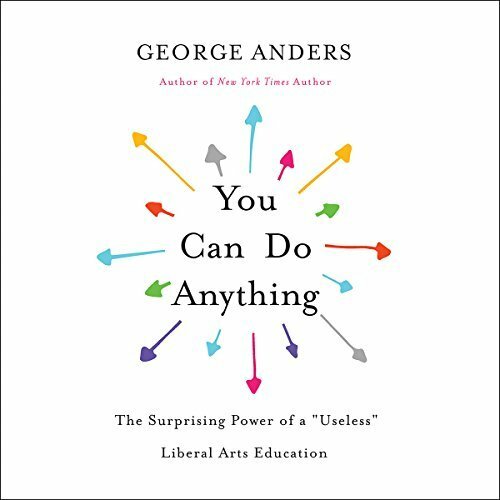 The journey started in early 2016, when I embarked on a new nonfiction book, "You Can Do Anything: The Surprising Power of a 'Useless' Liberal Arts Education." (You can learn more about the book via this link.) My editor at Hachette Book Group, John Parsley, wanted an audio version, too. That left us with the tantalizing question: Who should do the narrating? "Give it a try," John suggested. Authors' voices are gaining appeal these days, he explained, even if we aren't as polished as the best-known narrators. My recording-studio credentials didn't extend much beyond a few local podcasts, including one recorded in the muffled environment of a Weber Grill packing crate. No matter. In that context, I'd been a one-take wonder, speaking confidently and clearly. Swept up in the easy euphoria of these small-time triumphs, I told John: "Sure!" On the morning of my big day, I nibbled on a peach -- nothing more -- for breakfast, and then donned faded jeans and a rumpled old work shirt. I probably looked like an extra from "Grapes of Wrath." So be it. Arriving at the studio, a sudden attack of stage fright took hold. No cardboard boxes here! Instead, our engineer, Jermaine Hamilton, was adjusting sliders at a control board the size of a church organ. He rose, shook hands, and pointed me toward a stool in a glassed-in booth. Masking tape on the carpet marked the stool's position; my seat wouldn't budge an inch during the entire session. Settling in, I welcomed the sight of a chest-high music stand in front of me, containing an iPad version of my manuscript. But what was this scary metal object about eight inches from my face? Behold: a Neumann U87. The next few days of my life would be governed by this $3,600, German-engineered microphone. The burnished metal contraption has been the first choice of everyone from the Beatles to Beyonce. "It's what gives NPR's programs such a distinctive sound," Jermaine told me. "It's an amazing mic. It picks up everything." Yes, it does. Over the next few sessions, the Neumann U87 would record my fingernails clicking against the screen of the iPad, in the midst of page turns. It would record my toes jostling against the recording stool. It even recorded the sound of my sleeve brushing against my headphone cord, when I made the mistake on Day 2 of wearing a properly ironed shirt. During my five-day stint, we re-recorded nearly 80 passages because of the Neumann U87's powers. Initially, each slip-up embarrassed me. Over time, though I came to appreciate the caliber of technology (and coaching) that defined this project. As long as I didn't mind being corrected . . . as long as I was willing to learn . . . this difficult debut could turn into something magical. We weren't just creating an audio book. I became the lucky beneficiary of what amounted to a master class in how to be a strong narrator -- and, by extension, a better public speaker. Here's what I learned. When in doubt, slow down. For most of us, the nervous energy of being on stage impels us to start talking too fast. That's bad for three reasons. It's harder for listeners to follow; it gives us less time to breathe, and it cheats us out of the ability to speed up when we get to an exciting moment in a story. During the first 30 minutes of our recording session, director Ron Butler every few minutes gently urged me to slow down. He was right. Talk to a friend. (Even if he or she is imaginary.) Some passages need a stage voice, especially if they involve statistics. But other sections -- especially those that touch on people's dreams, struggles, worries, etc. -- benefit from a more intimate touch. I had trouble finding that tone at first. When I misfired, I could hear Ron's voice through my headphones, encouraging me to imagine telling those stories, for the first time, to a friend or family member. Sustaining that illusion helped elicit the necessary elements of wonder or vulnerability. Mix it up. Whisper at times. Laugh a little, too. More pointers from director Ron, who doubles as a prominent narrator in his own right. Early on, he encouraged me to lean into the microphone and whisper the concluding sentence of a zesty paragraph. Dang! It worked! Suddenly it seemed as if I was quietly confiding a rare truth to the audience. As our sessions played out, I got more adventurous. To deliver a bashful aside, I mumbled the first few words, and then chuckled at my own predicament. The producers liked that one. (It's in Chapter 10.) I hope you do, too. Get to know your tongue-twisters. Tame them. How hard can it be to say intermittent? Or digital? Or sociology? To my dismay, all three of those words (and several others!) turned out to be jaw-breakers for me. Intermittent repeatedly popped out of my mouth as intermediate. There's no way of knowing, before a first reading, which words will trip you up. That's all the more reason to rehearse before a live event, or to spend extra time in the studio getting comfortable with your material. If the snarls never go away, now and then is a perfectly fine substitute for that brutish intermittent. Nail your endings. Each time I approached the end of a section, I began fading out, choosing to ponder the best way of opening the next section with a bang. Bad call! As director Ron reminded me, listeners want crisp and convincing conclusions. Those final phrases are the payoff for all the material that came before. Each ending turned out to be its own story, but in many cases, slowing down and lingering over a key word helped a lot. Trust your technical team; everyone wants you to succeed. How do you pronounce artes quae libero sunt dignae? Months earlier, I had glibly slipped that Latin phrase into Chapter 11, as an allusion to the ancient Roman concept of studying arts worthy of a free man. Now I had to pronounce it. Stumbling through each term, I reached out to producer Jeremy Wesley for a lifeline. A few moments wait ... a quick Google search on his part ... and I suddenly knew a lot more about Latin's silent g than I had before. The bigger lesson: whether it's an audio book or a keynote speech, the people shaping the production have lots of wisdom to share. All we need to do is seek their advice. When everything is going badly, bite into a green apple. Years from now, I will probably wake up a cold sweat some night, remembering the worst moment of recording Chapter 1. My throat had gone dry. My saliva glands were overcompensating to a grotesque degree. I kept wanting to cough. A routine paragraph was becoming a nightmare. Fortunately, my engineer, Jermaine, knew just what do. "Let me get you a green apple," he declared. "Take a few bites." To my astonishment, his folk remedy worked. Two minutes later, I was back in control -- ready to knock off the troubled paragraph and keep moving forward. "There's something about the acidity . . . " Jermaine began, but I waved him off. I'd rather believe in magic. Thanks to the wonders of digital editing, all the studio misadventures described above have vanished. The experts assure me that intermittent sounds fine each time in the final version. As for the healing powers of Granny Smith apples, that will remain our little secret. It may be years before I'm back in the book-recording studio again, but the next time around won't be quite so terrifying. If you're interested in seeing how this audio book turned out, the answer is just a click away. To sample (or buy) the Audible version, click here. The recording also is available via Downpour, here. And for yet another version, try this link. Of course, if you'd rather stick with print or e-book formats, that's fine, too. More information on the book is here, and links to Barnes & Noble, Indie Bound and Amazon are here.